Have a piece of Savannah's storied past right outside your door with Southern Belle's Savannah vacation homes near Colonial Park Cemetery. Built in 1750, this cemetery was the city's primary burial ground for over 100 years, and it contains a large number of historic graves. The cemetery has been closed to new burials for a long time, but its historic presence remains and it is now the oldest Savannah municipal cemetery that is still intact. You can have it as your vacation backdrop when you stay in our vacation rentals Savannah GA near the cemetery on Oglethorpe Avenue. One of our available Savannah vacation rentals in this area is the Oglethorpe Manor Garden. This is one of our smaller Savannah vacation homes with room for four guests in two bedrooms with one bathroom. It overlooks the cemetery on the north end and is also close to a number of other Savannah attractions like the Owens-Thomas House and Oglethorpe Square. As is standard with all of our vacation rentals Savannah GA, it offers plenty of nice amenities, including flatscreen TVs, wireless internet, private parking, a washer and dryer, two queen beds, full kitchen and central air. Savannah vacation rentals from Southern Belle are always meticulously designed and reflect both elements of the past as well as modern trends. Oglethorpe Manor Garden features soft neutral shades and the main sitting room has a casual modern look with sofas and chairs arranged around a large flatscreen. Immediately adjacent is the full kitchen, which features full-sized standard appliances and lots of counter space. It has a cozy feel with wood floors and cabinets. It also has a small breakfast table with two comfortable chairs. The bedrooms feature queen-sized beds and additional seating, lamps and stands, as well as a flatscreen TV. This is one of our excellent Savannah vacation homes that would be great for an individual or couple stay, or even a small family. Every room in the house is spacious and you'll have way more privacy than you would get in a hotel. Once you've settled into one of our vacation rentals Savannah GA, you can continue with the best part of exploring Savannah. Guests always love that you can walk nearly anywhere in Savannah and it's especially true when you stay in our ideally located Savannah vacation rentals. Positioned right in the heart of the historic downtown, you only need to go outside your door and start walking in the direction of what you want to see. From this house, you can stroll north to find the Davenport House Museum, the Owens-Thomas House and Leopold's Ice Cream. Also to the north are Columbia Square and Warren Square. If you continue down Oglethorpe to the east, you'll eventually run across the Webb Military Museum and Crawford Square if you take a slight turn to the south. Directly south you'll find the Colonial Park Cemetery, and just south of that is the Cathedral of St. John the Baptist, as well as Troup Square and Lafayette Square and also the Flannery O'Connor Childhood Home. Head west on Oglethorpe from this property and you'll discover the Juliette Gordon Low Birthplaces, plus Chippewa and Wright squares and also the Harper Fowlkes House. All of these sights are within a short radius of this property and there's so much more to do in Savannah beyond that. Most Savannah visitors are also keen to explore Forsyth Park, which is the biggest park in the city and has a number of famous attractions like the iron fountain and the fragrant gardens. Another popular spot is River Street along the Savannah River. In Savannah's past, it was home to rows of warehouses serving the city's busy shipping industry. Those warehouses have been transformed into a wide range of restaurants, galleries, shops and more. If you have time to spend outside of Savannah, you can't miss taking a trip over to Tybee Island. It's only 30 minutes from downtown and offers all the sand and surf you could want. Make sure to visit the Tybee Lighthouse on the north end of the island as well as some of the local waterfront restaurants. Explore Southern Belle's incredible selection of vacation rentals Savannah GA today to find the perfect property for your stay. 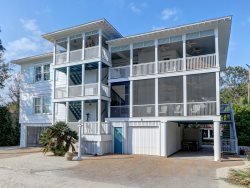 We have something for everyone with Savannah vacation rentals to accommodate both large and small parties. The location was perfect, allowing us all to walk wherever we wanted to go. The home itself was very clean and provided the 4 of us with plenty of space. If ever traveling to where you have properties in the future, we will not hesitate to book with your company again. Beautiful property appeared just as described. Lovely furnishings and comfortable beds!